We call this type of dog icing a "frosting" because it is typically used to frost a dog cake. It spreads well and is easy to use, just like a human's cake frosting. It can be mixed up thick enough to use to decorate by piping with cake decorating tips and will remain in place. K9Cakery has been on the forefront of manufacturing dog cake frosting. Many of the large dog bakeries choose to use Magifrost dog icing because it is easy to use. All you have to do is add water and stir. They typically buy large bags but it is sold in smaller bags if you are not planning to decorate large quantities of dog treats. Yogurt frosting had been the popular type of frosting. However, many dogs are lactose-intolerant. Dogs do best with small amounts of dairy. 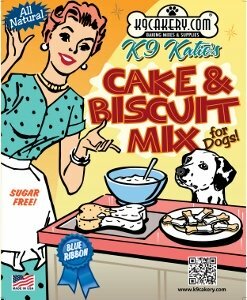 So K9Cakery developed a non-dairy cake frosting. It dries hard and will not melt, even if you leave the cake in a hot car or ship it via a hot truck. The frosting does not need to be refrigerated. A yogurt frosting made with real yogurt will require refrigeration. Special handling would be needed for shipping. What we refer to as dog treat icing is analogous to royal icing. In fact, it is often called "royal icing for dogs." The special characteristic of this type of icing is that it tends to flow easily. If you wanted to "flood" an area of a cake with a color, you would use this icing with ease. It also works well for drizzling color over dog treats, or for dipping dog treats. Magifrost dog treat icing is a non-dairy icing. It dries hard and will not melt in the heat. When it dries, the treats take on a beautiful glossy sheen that looks like the icing is still wet. It does not need refrigeration. 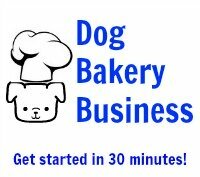 Dog bakeries are able to ship their treats across the globe without worry that the receiving party will open a package to a gooey mess, unlike what would happen if candy coating chips were used as an icing. We get questions about using the color red for the icing. If you use the powdered icing colors you do not have to worry about red dye # 2, which is what we think people are concerned about. Icing for dog treats can be made any color you desire. Have a question about dog icing? Click here to ask our expert.